React Native App for Your WordPress Blog Using WP-API | We all know that the popularity graph of PHP is going down nowadays comparing Python, Node.js etc. Because of that, nowadays PHP is limited to WordPress mostly. But WordPress is a giant than we think. As we already know it is a free and open-source content management system based on PHP and MySQL. Its Features include a plugin architecture and a template system. Thousands of themes and plugins are ready to help you in developing a blog in WordPress. So that, it only takes an hour to completely set up a blog using WordPress technology. 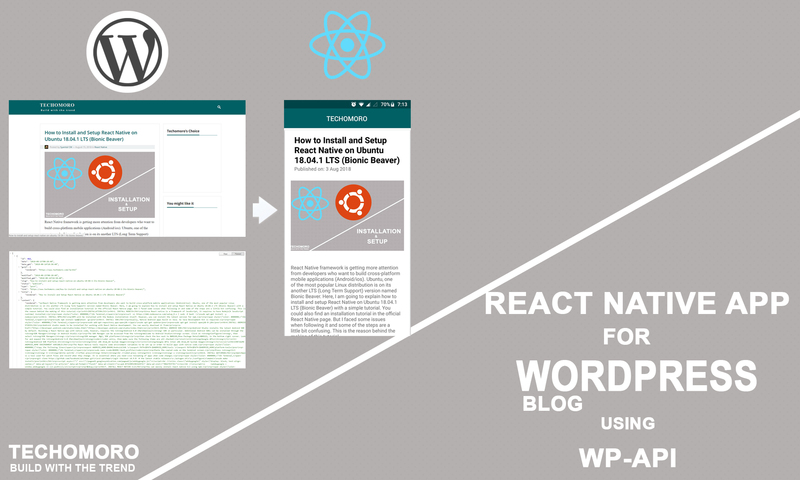 Here I am going to create a mobile application using React Native framework for an existing WordPress blog using WP-API (WordPress-API). In this tutorial, I am using the WP-API of my blog which is made using WordPress. If you own a blog, you can use the API of it. I have shown the WP-API of my blog below. This only returns the posts data. You can also get Author, Media, Categories etc by changing posts part in the URL. But _embed part embedded all these data with the current collection of data. I already made a tutorial on installing and setting up of React Native. You can see it from the link below. But note that you have to change the project name AwesomeProject to ReactnativeWordpress (Step 9). Because in this tutorial, I am using that name. But as I told, It is not mandatory for you to follow my naming systems. You can choose your own. In that case, you have to use them in the upcoming steps too. Nativebase is a node package which allows you to use some UI components for React Native. If you can build your UI components using Flexbox, or you are using any other packages to setup UI, then this step is not mandatory for you. To install Nativebase inside your project, run the below command from the root folder of your project. It doesn’t need to run react-native link always after installing a package. But you have to run it after installing all the packages for your project. So we installed all the packages required for our project. Now, we are going to start coding. Working of the ReactNative framework will start from index.js file always which is located in the root directory. In the index.js file, you can see that a component named App has been imported first from App.js. So the code inside App.js will be executed as default in ReactNative. We are going to code inside this file. We have to import default React components and the packages we installed to App.js first. The usage of this components and packages will be explained by me later. Now add a class named App and export it. Inside this class, we first need to declare a constructor and the states needed to store the API data (Posts data). componentDidMount() is a function which executes immediately after loading the component. So in our case, this function is invoked immediately after loading App component. https://www.techomoro.com/wp-json/wp/v2/posts?_embed will return all the posts on the blog https://www.techomoro.com as JSON API format. If you have a blog made in WordPress, you can easily get the JSON form of all the posts by concatenating /wp-json/wp/v2/posts?_embed with the domain name. Since I added _embed at end of the URL, it returns the API with Author data, Media data embedded with it. It reduces the number API’s to be called. The below code will fetch the WP-API and stores it in the state posts as an array. I also added a state isLoading to show an activity indicator before the API data is fetched. isLoading will be true as default and after fetching the API, it changes to false. This will toggle the views and will be explained by me later. Now it’s time for the render function which renders the view of our mobile app. I just used Nativebase UI components for easiness. You can use UI components from react-native if you need. The UI components that we see on the mobile screen is the one returned by the render() function. So we have to declare a render() function and inside it, I am returning an Activity Indicator if the state isLoading is true. This means the WP-API is not fetched by our app yet. After loading the API data to posts state, the isLoading state will be changed false and the code below will be executed. I added some line spaces in between the codes just to make this code more understandable for you when I am explaining it. Let us start. Moment.locale(‘en’) just change the Published Date language to English since it supports multiple languages. There is nothing else with it. Now there is a Header section which also doesn’t have much role in this tutorial. It displays a header on the top of the app with a title TECHOMORO. We need to closely look at the Content section. this.state.posts.map((item, index) will map throughout the posts array which contains the post data from our WP-API and each item (post) will be shown as Cards. So a card represents a post. In each Card, there is four CardItems or sections. the top will display the title and posted date, the other one display featured image, next section displays the post content and the last one shows the Author name. item.title.rendered will contain the title of each post. This will be shown directly. The item.date will contain the date posted but the format is tough by the human to read. SO I used Moment package to make the date easier to read. Now it’s a tricky part. We need the featured image of each post. But WordPress stores the featured images in separate databases. But we already got them using _embed. So I iterated through the embedded collection using the featured image id. Now the URL of each featured image will be in subitem.media_details.sizes.medium.source_url. I just gave it to image component. Now the next section will show the contents of the post as native components instead of HTML. We don’t have to worry about it since react-native-render-html take care of it. item.content.rendered will contain HTML tags and react-native-render-html package converts it to native components. Now as the same as finding the featured image URL, Author name is fine by using the Author id in the post. You can also add an icon to your app by referring the below link (optional). Also, generate a signed apk for your app (optional). very cool, how would we open a post in a new screen or modal for example? It’s amazing, Thank you so much for gathering all this information in one post, it will be extremely helpful for all people who work on React technology.